Fly-fishing looks effortless but that’s deceiving. It’s an intensely complex process. The angler needs to know exactly the right ‘fly’ to cast to lure fish. She needs to know how to cast, when to cast, and where to stand in the stream. She needs to understand the depth and speed of the water, and be mindfully aware of how and where the dappled sunlight might be sheltering trout. A fast-moving stream has multiple current seams, depth changes, boulders or other obstructions and variable water speeds. In fly fishing, the angler needs to account for several factors, such as the distance and angle of the cast, the size of the mend, the speed of the swing, the position in the water, the number of steps taken between presentations, and the fly itself. Leaders, across many sectors, are facing an imperative today because of rapidly escalating complexity and uncertainty. For leaders to navigate the whitewater of change is to go well beyond competency, expertise, strategic planning, and managing a competitive edge. Leadership invites us to be compassionate and courageous, to cultivate greater self -awareness and authenticity, which translates into trust in one’s self and in others. All of this change means that we are increasingly leading organizations during times of transition and for leaders this requires cultivating the capacity to hold volatility, ambiguity, complexity, tension, conflict, and unresolvedness, perhaps over sustained periods. The capacity to hold others’ points of view without championing one and making the other invalid, holding competing ends of a conflict is healthy, creative tension, and sets a foundation for outcomes where all sides win. Focused attention and the capacity to hold tension creatively are powerful tools of the human spirit. Yet, time and time again, in leading retreats, across many professional sectors, I encounter leaders who struggle to stay focused, who are overworked, overbooked, overextended. We are addicted to multitasking and distraction. Increased performance demands when coupled with fractured focus amount to a true crisis for many of the people I work with as a retreat leader and leadership coach. 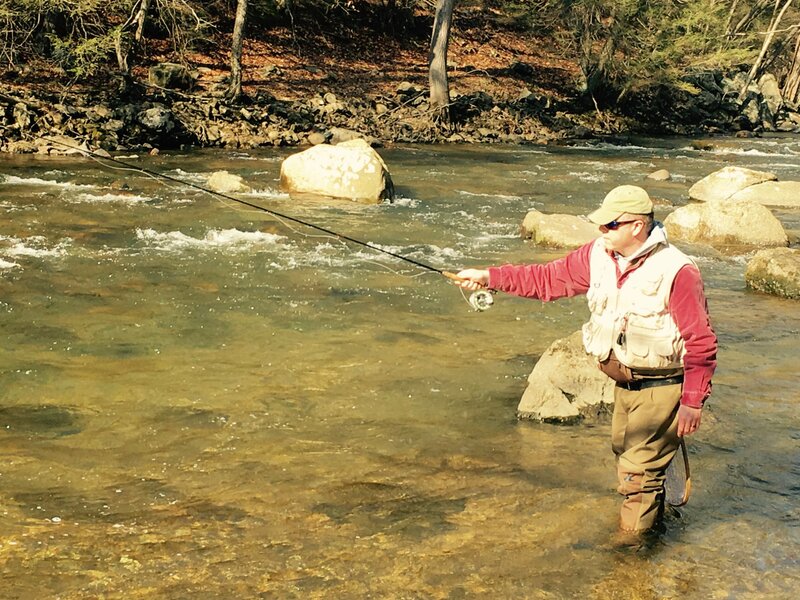 Fly-fishing is an intense immersion in mindfulness. One stands in the river while the fly drifts along. This is a moment of being totally there, totally present, intently waiting and watching for any sign of movement around the periphery, mending when required, making sure the fishing line drifts naturally, effortlessly. Perhaps my next retreat, my next leadership development workshop will be right here on this fast-moving stream, learning the art of fly-fishing.